Travel buyers’ top hotel program goals for 2019 are to reduce program costs, increase policy compliance and improve traveler satisfaction. In order to achieve these goals travel buyers need to use the right metrics to measure performance, use that data to build a robust plan and measure results based on key performance indicators (KPIs). This sounds nice, but many travel buyers run into a big hurdle right at step one: what is the right data? What KPIs matter most? 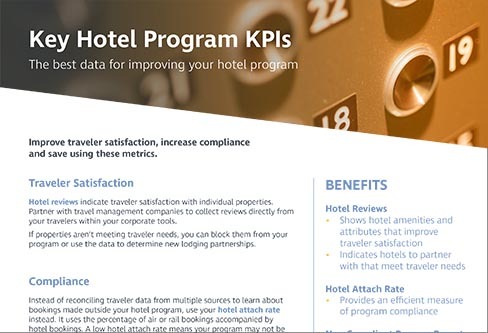 We went ahead and picked out the most important metrics for measuring hotel cost, compliance and traveler satisfaction, so you can work smarter and achieve more.